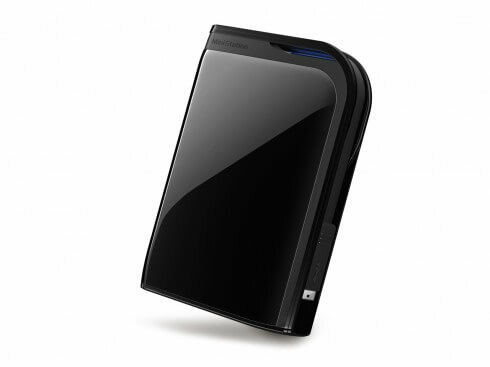 Buffalo Technology has announced the launch of the MiniStation Extreme, a ruggedised USB3 portable hard drive. Conforming to the US Military’s MIL-STD-810F 516.5 Procedure IV, the shock protection on this drive means that it will survive a fall from over 2 m or 6 ft.
And if securing your data against physical damage isn’t enough, the MiniStation Extreme also comes with 256-bit AES whole/full disk encryption to prevent unauthorised access to your data. There’s an integrated USB3 cable which snaps in and out of the Extreme, keeping it all neat and tidy. The MiniStation Extreme is available in 500 GB and 1 TB sizes at £78 and £113 respectively, and comes in piano black, silver and red. No white yet for the iPhiles.